#Arborday We planted 14 trees and shrubs this weekend. Kathy moved 6 red buds from the old house they may or may not live but with the wet weather she was able to get the roots out so we are hoping for the best. We also planted 2 hazelnut trees, 2 pecan trees and 2 Saskatoon blueberries. Today our nephew Carter brought over a couple of choke cherry bushes that he got at school for Arbor Day. They don’t have a place for them but we found one. Kathy planted about 8 rhubarb plants that were given to us and we got more work done on the chicken run. 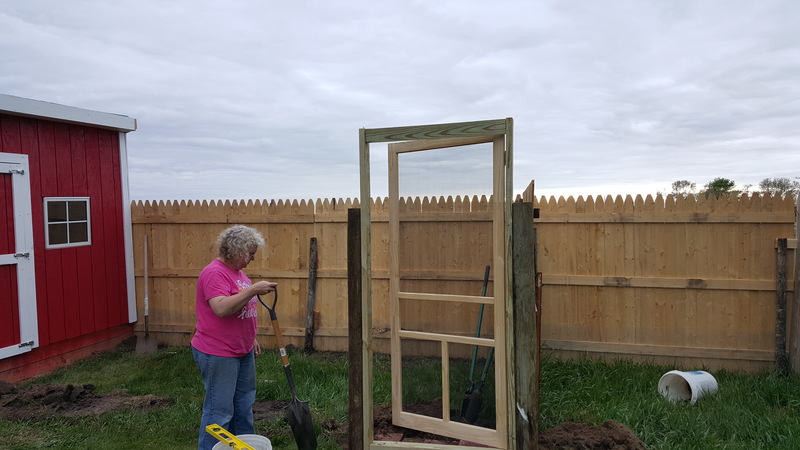 I got the west fence up and we put posts for the east fence and decided that we were going to put a door/gate into the chicken run. We will be able to get into the chicken run without going through the coop.